The mechanism turns the dial of the radio either to the left or right. 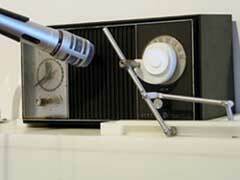 The microphone then captures a three-second sample of the audio signal. This signal is compared to a signal saved in the microprocessor's memory of the word "god." If the new signal is not equal to the signal in memory, the mechanism turns the dial again and the process is repeated. If the signal captured is equal to the signal in memory, the piece deduces that it has found the word "god". It then triggers an electronic bell and marks one unit on an electronic odometer. In this way, "Looking for God" tries to metaphorically replicate humanity's own pursuit of understanding the world. For an obsessive station scanner like myself, this seems like the coolest thing ever.